In the latest Clyde River lecture, David Weale told us when communities cease to take part in their own traditions, they start living someone else’s story, and the only way to counter this trend is to revive or take up our own traditions and, in the process, create our own stories. David said that when he was driving out to Clyde River for his lecture, he heard a radio interview with the father of one of the five young lost fisherman in Wood’s Harbour, Nova Scotia. The statement that resonated with him was the father saying that if he needed 50 boats to go out there to search for the boys from his community and neighbouring communities, there would be 50 boats that would go out tomorrow if he put out the plea. That is what a community does. They share the good times, the bad times and come together in force to deal with tragic times. They know each other stories, generations of stories, so when something happens to one, they all feel it. David says we all represent a story, a story about ourselves, the lives we have lived and continue to live. We share that story with our family, friends, neighbours and all those we come in contact with in our lives. And within those stories are traditions, many of which are long gone, others existing in some form and ones that are new. Communities need their own stories, and traditions and stories go hand in hand. They demonstrate what we find important, what we value. It is dangerous when we lose control of them. Mass media presents us with many stories about what we should buy into, who we ought to be and what we need to consume. At the local level, we need to engage in our stories. David made reference to the Clyde River community resolutions series and our latest one about “starting or re-starting a tradition.” In preparation for his lecture, he wrote down all the community traditions that he could think of from Island history and went through them with us one by one. The Pound Party – A community event where people would take a pound of something to help a family in need. The Basket Social – Ladies would prepare baskets and auction them off to the highest bidders and then the buyers would have the delight of enjoying the basket lunch with those ladies. The Frolic – We may know it more as a “working bee” where people would come together to combine work and leisure. They would labour all day in order to earn the opportunity to have a social of food and music afterwards. It satisfied the need to be industrious and the need to get together and have a good time. The Mayflower Expedition – When mayflowers would appear in early Spring in PEI, people would go out to the country on the train and pick baskets of mayflowers to take back home. Ground Spruce Christmas Excursion – In St. Georges, PEI, the whole community would go to the woods and gather ground spruce which was later used to decorate the church for Christmas and offer an opportunity for a social. The Summer Tea Party – It was often the biggest social event of the year where community members decorated booths or set up a horse ring (a carousel that was driven by a horse and offered a ride for kids). The tea was called a Sunday School Picnic in some communities. Christmas Concert – Children from the school would put on a concert. Dress-up Skating Carnival – People would dress up and get together for a skate. The Wake – When people passed, the deceased would be waked within the community. David says nowadays, so many residents who have lived their entire lives in one community are more often taken elsewhere to be waked. The Chiverie – When the neighbours in the community would dress up and show up to chiverie newlyweds which involved banging pots and pans, shooting guns, placing spruce needles in their bed or animals in the house. Ice Racing – Neighbours would get together to race their horses on the frozen river and others would gather to watch. Bridal and community showers – An event to celebrate an upcoming or recent marriage where the community would offer gifts. Decorating an Easter bonnet – Decorate a hat in celebration of Easter. 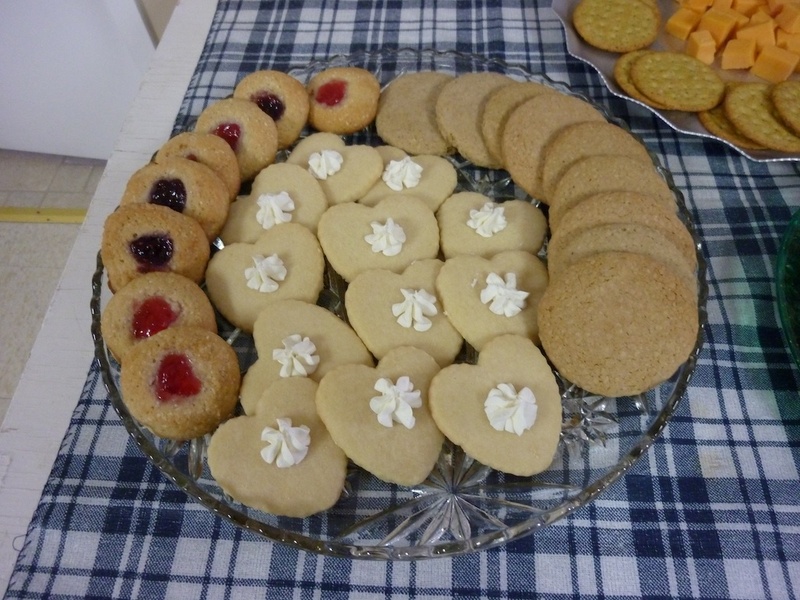 The Clyde River Women’s Institute still celebrates this tradition. In Clyde River, some of the traditions that we still take part in would include our annual Strawberry Social, Christmas Party, crokinole parties, Canada Day Celebrations, Art in the Park and the Sunday School picnic, and we capture stories on our Clyde River website. In closing, David read from his first issue of RED Magazine that tells Island stories. He had interviewed Ethel MacPhail, and the story pointed to the traditions or Island codes of behaviour that are rules, not law, but yet were never to be broken. David was told that Ethel was a great resource of history, so he called her up to ask if he could visit. Sitting at her kitchen table, David asked Ethel if she minded if he tape-recorded their interview. She said yes, but he could see that she was not at all comfortable with being recorded. They chatted for a while, but she just couldn’t get into a conversation. Even though they went through her old photographs which David thought would take her mind away, she still could not overcome her fear of the tape recorder. David succumbed and wrapped up the interview, thinking she would be glad to see the tail end of him. The next morning, he received a call from Ethel and she sounded terribly upset. David was nervous that he had contributed to her distress. Ethel said to David, “Do you realize that you are probably the first person in three generations to come into this house for a visit and leave without being offered a cup of tea.” She had broken the ancient tradition and she could not be consoled. David’s lecture entertained us but also gives us a good deal to thing about. I told someone after that his talk was halfway between a lecture and a sermon. He personalized the meaning and importance of community. He challenged us to take the chance of being ourselves which is our opportunity as a community. Respect and engagement in tradition is the legacy that our ancestors took to heart, the same legacy that can be ours and the legacy that we can share with younger generations. Stories are a way to pass history along from one generation to the next, but a tradition can be an interactive and participative way to carry on the important experiences of culture. By participating in the tradition, we feel a connection to each other, to all those who took part in this tradition in the past, along with a sense of responsibility to mentor those who will carry on the tradition in the future. And as the present generation, we carry the torch. No pressure, right? Starting a tradition may also involve re-starting a tradition, if the torch has been dropped somewhere along the way. Start or re-start a tradition. Are there any traditions that your parents or grandparents took part in that have fallen by the wayside and you miss taking part in them? Were any of these traditions part of a community activity? What were they? What did you enjoy about them or hearing about them? If you or we as a community restarted any of these traditions, how would they be modernized or made more relatable to our current times? This could be an excellent conversation to have with children or grandchildren to get their input. Firstly, they will enjoy hearing about the ol’ days and, secondly, they will bring fresh new ideas on how it could be done to attract younger people who will, in turn, want to carry on a tradition. Are there any new traditions that we could start as a community? If traditions connect us as a community and over generations, maybe this is part of the reason why communities struggle…they stop taking part in the activities or customs that once tied them together. Technology has influenced the evolution of communities over time. You once walked around your community; you then took a horse and buggy to the neighbouring communities; then you took a car, plane, ship or train to distant communities. The internet allows us to have a virtual community via the Clyde River website, for example. The underlying action is “interaction” and “traditions” are interactions we enjoy and want to do again because they represent who we are as a culture and our history as a community. Maybe checking in to the website to read the latest stories has become a type of tradition that has been adapted from the days of meeting at the corner store to hear community news. It is possible our lecture series at the old Clyde River School is helping us connect to the tradition of learning that once took place there. Joy Fit classes might remind us of all the fun we had during recess at school e.g. hopscotch, skipping ropes or team sports. We celebrate Canada Day each year with hotdogs and ice-cream, and the kids enjoy playing old-time games. There is an annual Christmas Party where we get to play in skits and games just like in the old school concerts. The Strawberry Social brings together people of all ages and those home from away for a reunion. Art in the Park reminds us of the stories of generations past that enjoyed the spirit of play and creativity that existed at the old Murchison Place property, now Murchison Place Park. The children that now play in the park may not know its history but they connect with its tradition. Other events like the Apple Pie Festival felt like times in our community’s history when people worked together to achieve a common purpose. Thinking about our traditions is great homework for our next Clyde River lecture with David Weale on Thursday evening, February 21st at 7:00 p.m. He will present “The Communal Islander – The Challenges to Island Communities”. Also, Monday, February 18th is Family Day in PEI. Are there any traditions that you, your family, friends, neighbours could take part in that would connect you to an important tradition or experience that you remember enjoying or hearing about from the past? As important as this day is, don’t you think our ancestors would have a little chuckle and maybe shake their heads to hear that we have become so busy in our lives that now “Family Day” has to be an organized holiday once a year? Take a sleigh ride at Pott’s Farm in Argyle Shore. Go tobogganing or skiing at Brookvale Ski Park. They have a two-for-one special on Family Day. Cornwall is hosting “Outdoor Family Fun” from 12:00 noon to 3:00 p.m. at the Terry Fox Sports Complex. Or create your own family/friends/neighbours event and, if it gets a “thumbs up”, think about making it a tradition. As for community traditions, well, that is something we may have a chance to discuss on Thursday evening with David Weale and at future events. The goal of the Friends of Clyde River’s, Historical Education Committee, is to get your ideas and feedback on what activities we could undertake to support historical learning for both those with deep connections to Clyde River and for those who are new to the community and want to understand more about the history of their chosen home. And let’s remember our virtual community that connects with us on our website. Maybe, it will require a second cup of coffee…so much to think about! Website reporter and early riser Kerrilee York attended the first Joy Fit class at Riverview Community Centre this morning at 6:15 a.m. until 7:00 a.m. along with a dozen other enthusiastic souls who braved the cold. Instructor Deborah made everyone feel welcome and uplifted. She greeted Kerrilee with a big hug as soon as she walked in the door! Deborah was great to show different variations of an exercise to suit all levels of fitness. At the end of the class, she gave out small laminated messages to each participant. Kerrilee’s message read, “Support and Challenge One Another”. So there you go. The most difficult part of a new exercise program is the jitters of attending the first class. Looks like it was a friendly place for all. February is heart month, so do your heart a favour and feel the love of our Joy Fit class. Congratulations to the Friends of Clyde River, Community Spirit Committee, for organizing this program. Joy Fit runs on Monday and Wednesday mornings from 6:15 until 7:00 a.m.
You know the best thing about winter? Not much happens and the days can be quiet. You know what is worst about winter? Not much happens and the days can be quiet. When we are busy, we want to rest and when we are resting, after a while we are looking for something to do. When we work, we want to play and when we are playing, we are thinking of things we should do. Therein lies the dichotomy of human existence. Let’s see how this human struggle can be balanced in light of our next community resolution. If any of you have children or a pet, you will already know that they are not conflicted about such things. They innately understand how to balance rest and play. What happens to us as we grow up is we get introduced to the “shoulds” that take up residence in our brains. So when we sit for a few minutes, or just generally goof around, that little voice in our brain says, “Now, we should do (fill in the blank)”. There are obviously things we need to achieve each day as a responsible adult, but how can we fit in more play while building community? The large crowds that attend crokinole on Monday nights already found the answer. “They make it a priority.” Others take the time on the weekend to watch their kids play hockey. Have you ever noticed that when you introduce more play into your life, you are more productive when you get back to your responsibilities? Here is a list that introduces a few ideas on how we could play more as friends and community. Please suggest your own in the comments section if you can think of some other good ones. Invite some people over for a board game or a came of cards…and don’t care about who wins. Watch your neighbour’s kids or grandkids play hockey or whatever sport they are involved in. Take your child or grandchild on a play date e.g. art class or story time. Libraries offer events and so does Confederation Centre of the Arts. There is also a new place called “That Fun Place” along by the North River Causeway. Check out their site at this link. It looks like a good place to burn off some energy and I have been hearing good reviews. Take a child to Owl’s Hollow or Toy R’us, buy a great toy or game and play together. Have a child draw your portrait and post it on your wall for all to see. Make cookies with your children and drop some over to a senior in the community! Invite some people over to work on a jigsaw puzzle. Join the crokinole group at the school once in a while. Watch some curling at the Cornwall Curling Club – here is their website. When is the last time you enjoyed a matinée or evening at the movie theatre? Here is the schedule at Empire Theatres in Charlottetown – link here. Once we have the right kind of snow, build a snowman! Or surprise us and build one in front of the community centre! Build snow forts and have a good old-fashioned snowball throwing competition to see which fort is left standing. Organize a group to work on a hobby and book the Clyde River community centre, so you can enjoy it together. Invite some musical friends over to play guitar or piano and have a sing-along. Double date with another couple. Invite friends over for comedy movie night and have themed food related to the movie. Get together and go swimming at CARI pool. See their programs here. Take tennis lessons at the SPA – link here. Learn a dance style – if you know someone who could teach dance, invite them to offer a few lessons at our community centre. We have a great sound system to turn the music up and move. Let’s build a playful community! So how it is going despite the chilly temperatures? Have you been inspired by our Community Resolutions series? I have been hearing about some of the activities you have taken up so far as a result of the challenge, and it seems you are having some good fun. I heard about one family that instead of watching Downtown Abbey, they invited their neighbours over for an evening of conversation and warm chocolate pudding cake. Another couple visited friends who featured their photos from their recent Greek cruise…now that would take them away from thinking of winter. Another person took along her grand-daughter to visit her aunt. Another called up some seniors for a chat to bring them up to date on news from the website. Other neighbours were planning to have a once-a-week get-together with no particular purpose other than just to enjoy each other’s company…now those are great neighbours. We just introduced resolution #2 where you can get a little more fit and get up earlier in the morning to enjoy Joyful Fitness classes at Riverview Community Centre on Mondays and Wednesdays from 6:15 a.m. to 7:00 a.m. beginning on February 4th. Link to story here. Google can be a great way to find out the answer to just about anything that comes to your mind, but how do we turn this challenge into a community building resolution? This coming Saturday, January 26th, you can come along to the first of a series of lectures at Riverview Community Centre from 1:30 p.m. to 3:00 p.m. For the complete schedule, link to the story here. Books: Great range of books covering literature, learning subjects and hobbies/crafts along with magazines, CDs, DVDs and videos. Programs for children: They have a lap-sit program for babies/toddlers 3 months to 2 years old on Thursdays at 10:30 to 11:00 a.m. where they sing nursery rhymes and other fun songs for young ones. Kerrilee brought along her twins Katherine and Victoria to this program as featured in the slide show photos. They have story time on Fridays from 10:30 to 11:00 am for ages 3 to 5 years old. Valentine’s Day Activity: They are hosting a Valentine’s Day Program for children of all ages on Saturday, February 9th at 10:30 a.m. where they will feature a Valentine story and craft activity. Learn more about e-readers: They will provide help to anyone who has e-readers, whether it is your iPad, Kobo or even your laptop, on Tuesday afternoons from 1:00 to 5:00 pm – You can source e-books through the library here. Origami Classes: Learn the traditional art of Japanese paper-folding on Tuesdays at 5:o0 pm. Art exhibits: They have exhibit space just outside the library room and are currently showcasing “Six Feet of Winter” by Alyse Nicholson. Well, here is a chance to join friends and neighbours to follow through on what could potentially be the most common new year’s resolution of all. Get a little more fit. Melody Sider from the Friends of Clyde River Community Spirit Committee has lined up Gym Teacher Deborah Christie from New Haven to lead exercise classes called Joyful Fitness featuring cardio and core exercises for all fitness levels. These classes can tie in with yet another resolution to get up earlier and have a more productive day. Her classes start at 6:15 a.m. and will run until 7:00 a.m. beginning February 4th and continuing on Monday and Wednesday mornings at the Riverview Community Centre. If you need a little more motivation, she promises the classes will be good fun…but, then it is always fun to get together with the folks in Clyde River. Let us know how it goes.